"Awesomely delicious!" 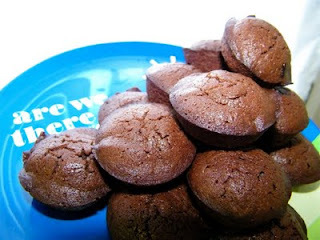 That's how Sean described this week's Tuesdays with Dorie selection, Brownie Buttons, chosen by Jayma of Two Scientists Experimenting in the Kitchen. And I couldn't keep him out of them! Well, we all thought they were great. My parents were over for supper again (a Tuesday thing at our house) and my dad and I agreed that I should have put a pecan half on top of each brownie before baking. I'll try that next time. It was a bit chaotic in my kitchen tonight, so I didn't get any pics of the process, but I will say that these brownies were simple and quick to make. The only thing I did differently than the recipe was that instead of melting the butter, chocolate and brown sugar on the stove, I did it in the microwave! It seemed to work just fine. Be sure to check out what everyone else did with this week's recipe! I agree that for all of the effort, I would like more than 16 tiny brownies! Glad that everyone enjoyed them, though. I'm a total believer in nuts with my brownies. But I'd probably just make them (loved the KH Tribute brownies better) in a pan next time. Next time, double it! Glad they were enjoyed. They look great, but a pecan on the top improves nearly every baked good!